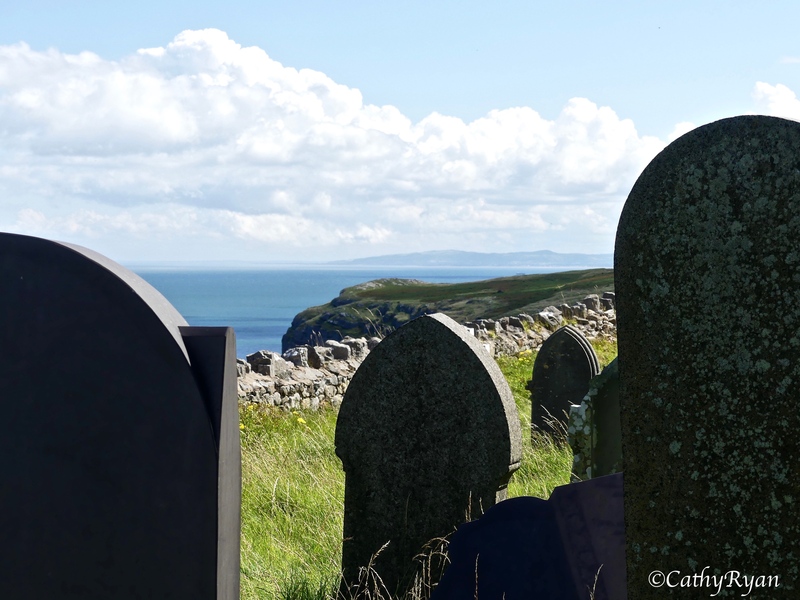 While we were exploring the Great Orme the other week we found St Tudno’s. 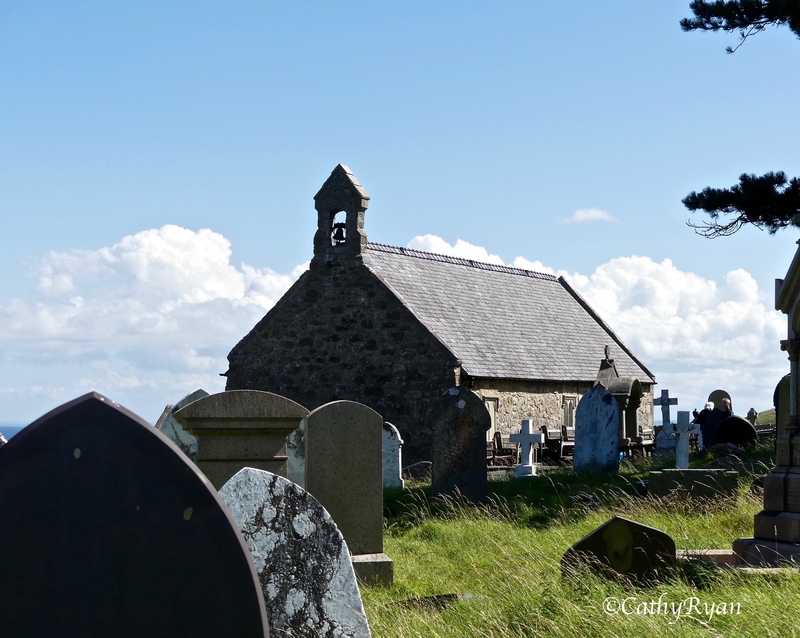 A lovely little church with fantastic views. 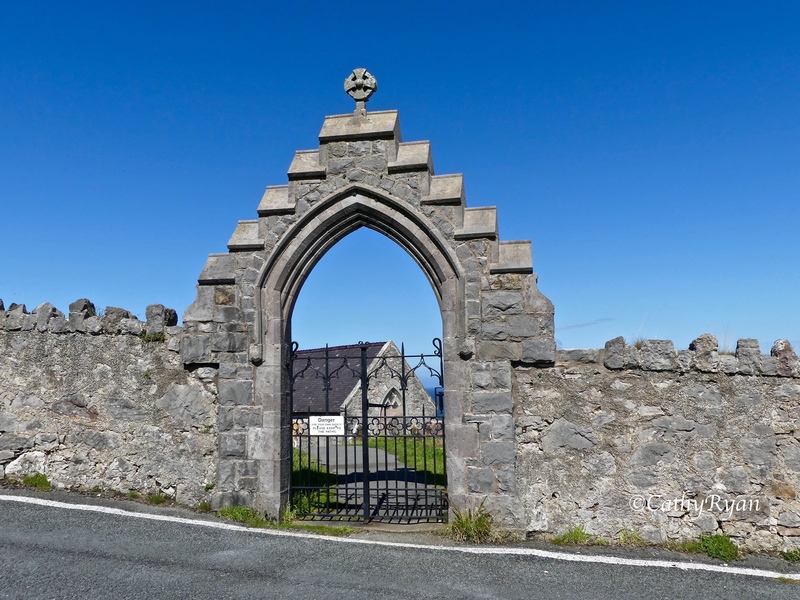 There’s been a place of worship on this site since the 6th century when a Celtic monk, Tudno, brought Christianity to the farming community living and working on the Great Orme. 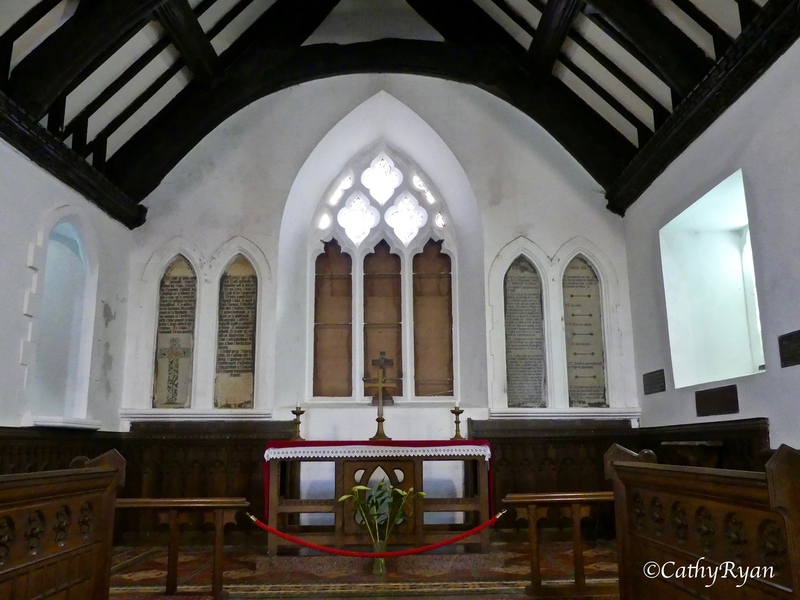 Nothing remains of the original structure, the present church was built in the 12th century and enlarged in the 15th century. 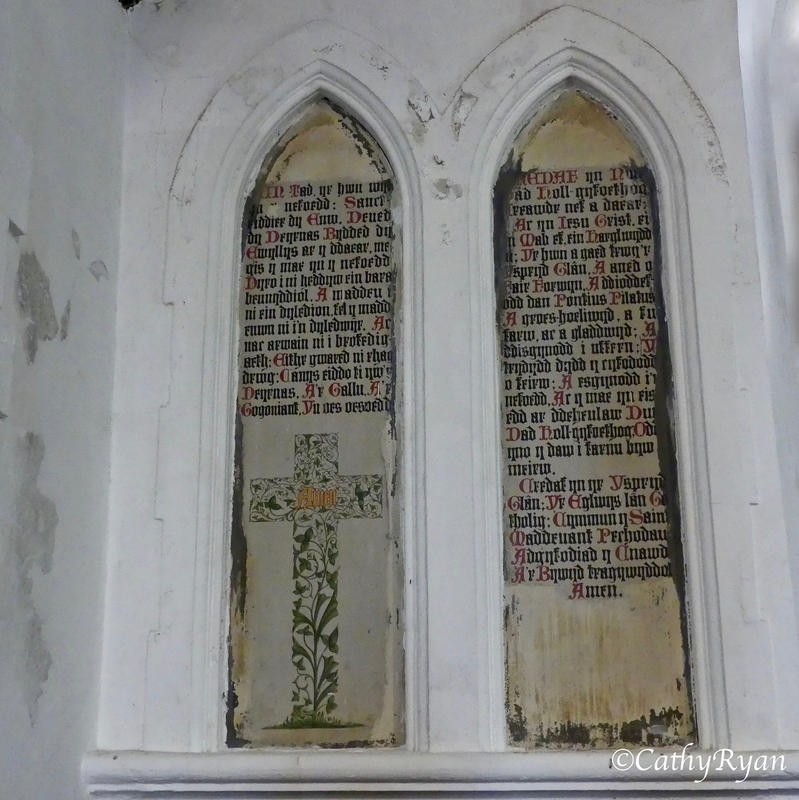 The stained glass windows date from the 19th to early 20th century. 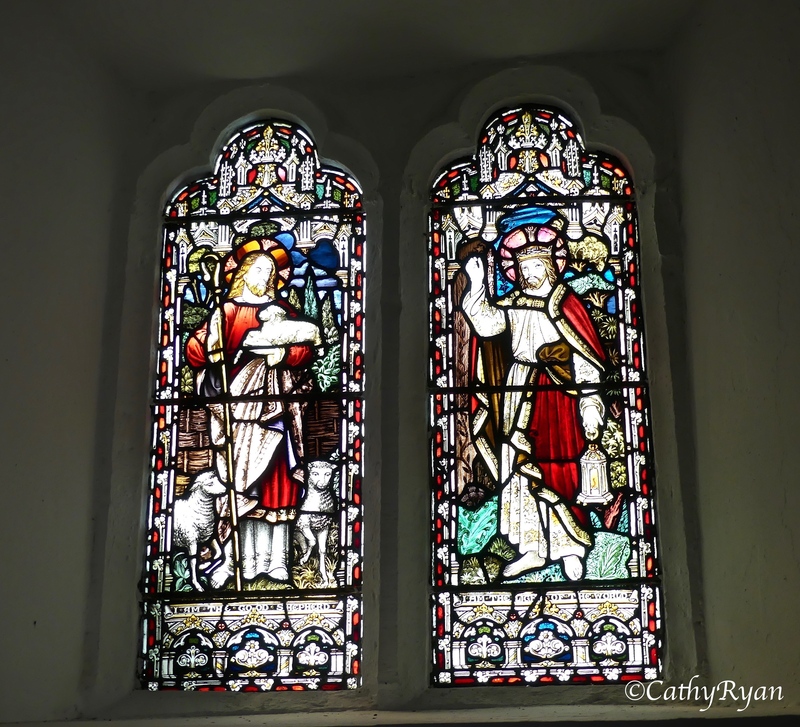 The first two depict Jesus, the Good Shepherd and Jesus, the light of the World. 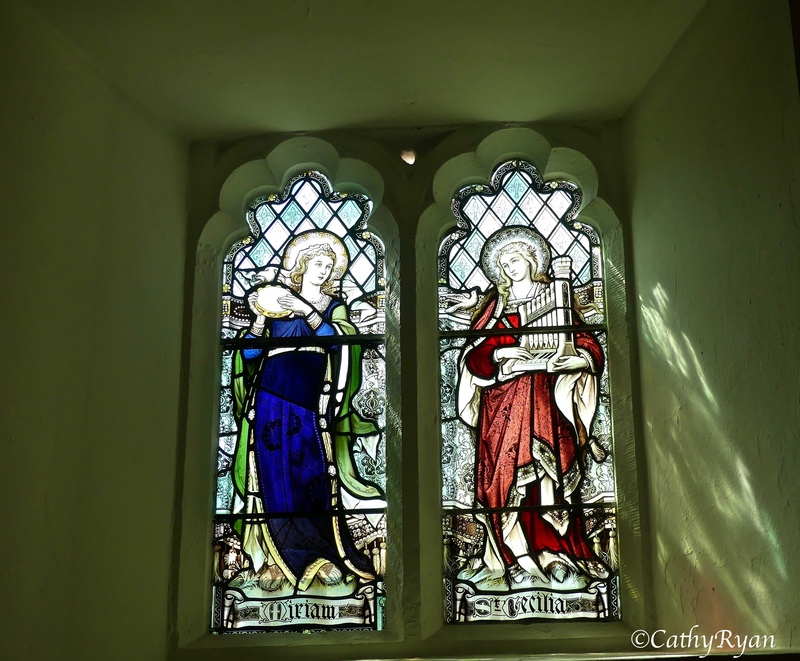 The second two are Miriam, the sister of Moses and St Cecilia, the patron of church music. During the summer the grass is left to grow as a haven for wildlife. Sheep keep it from getting too overgrown. ..and some are the total opposite, like these plain wooden crosses. 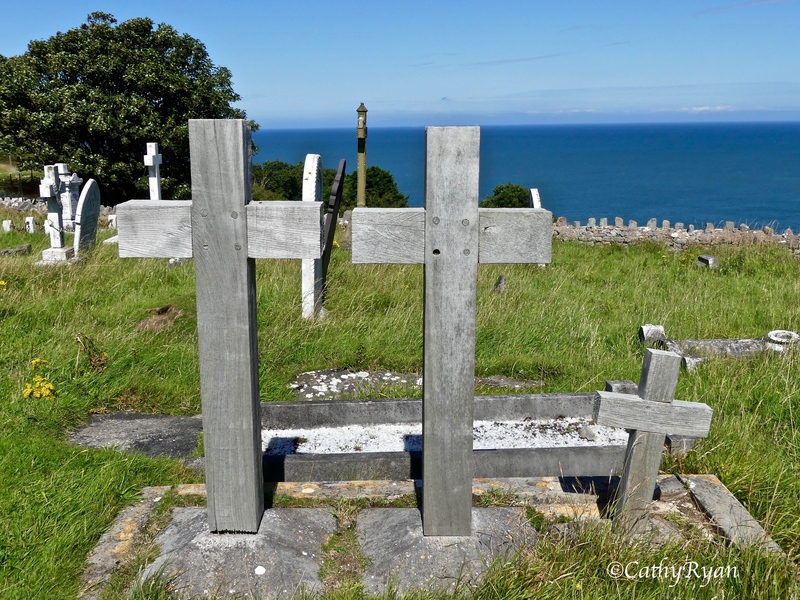 The two large crosses are memorials to two brothers who were both killed in the same year during the First World War. The small cross is in memory of their brother who died in infancy. 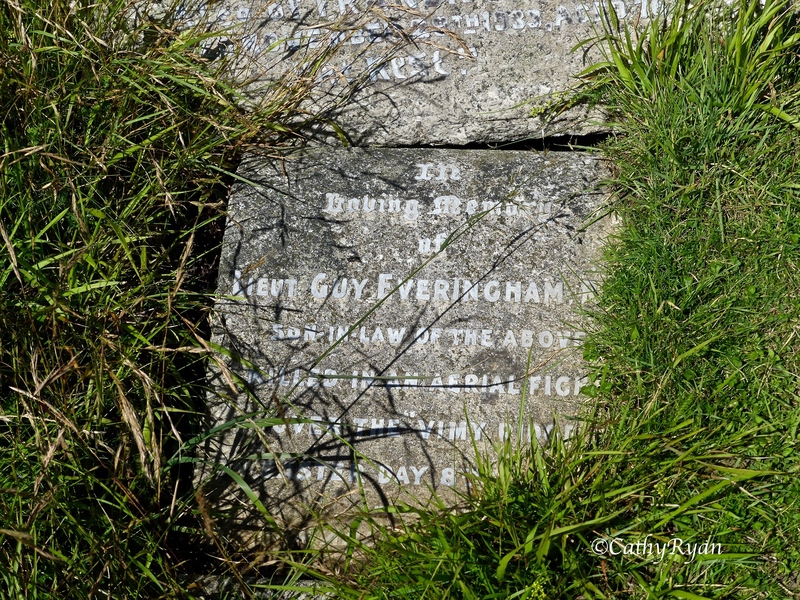 This stone is in memory of Lieutenant Guy Everingham who was also killed during the First World War, aged just 22. He was an observer on a flight that was filming German lines prior to the Battle of Arras. The plane was shot down by Baron von Richthofen, aka The Red Baron. Beautiful setting, Cathy. Fascinating history and a mix of stories. It really is beautiful, and peaceful too. Thanks, Shelley. I do enjoy exploring a graveyard, it can be so full of history and they are usually very peaceful. Gorgeous pics, and a lovely blue sky too! 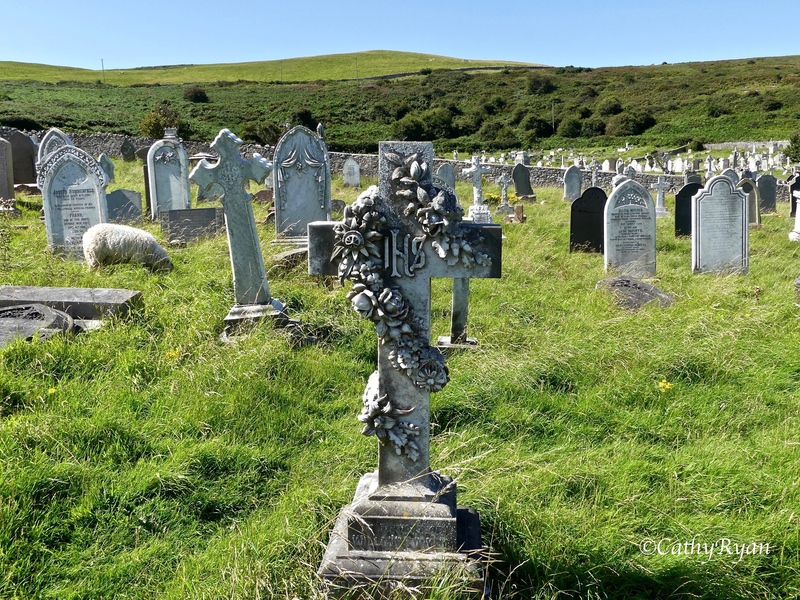 Graveyards are not to be missed and what a lovely setting for this one. The wooden crosses are the most poignant. Such a wonderful find, Cathy. Would you mind if I used some of the photos in an upcoming post? I would, of course, give you full credit for them and link back to your blog. It really was a great find. I knew it was there somewhere, just a matter of finding it 😀 Of course, please feel free to use whichever photos you like. Thanks so much, Cathy. That is so kind. What a beautiful and quaint setting. These are gorgeous. 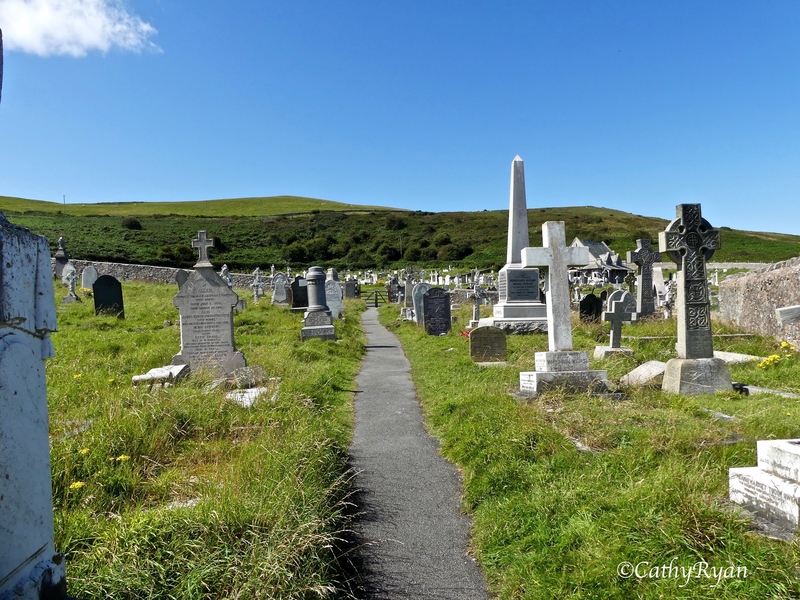 What a stunning graveyard! I love that the sheep is just innocently grazing among the grave markers. 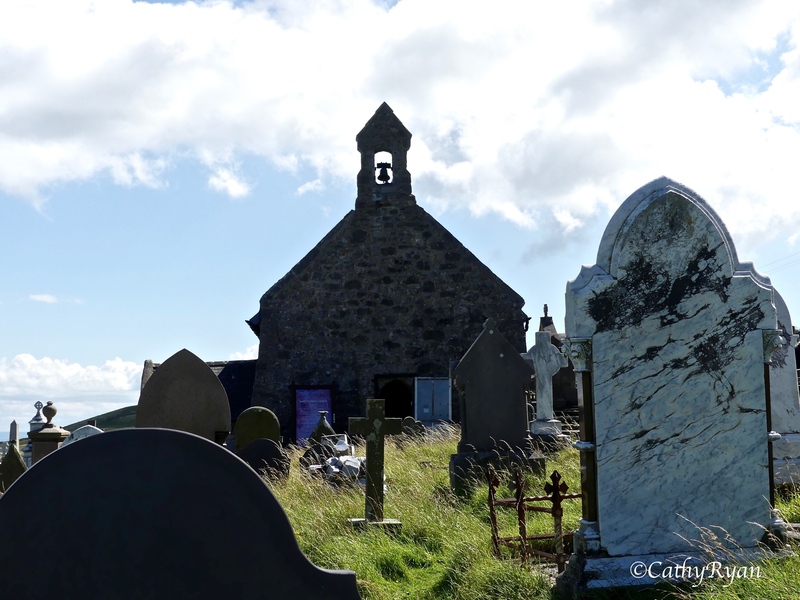 What a beautiful setting, Cathy, and I love how the church is nestled in the middle of the graveyard. The inside is simple and beautiful. It reminds me of the simplicity of the church where I was married. Stunning photography, as always. Thanks so much, Michelle. The views are amazing and I do love basic churches.